Just to prove that not all China batteries are crap. Tweens 250mAh 9V (actual 8.4V) 250mAh battery, why did I get the cheapest battery that is 250mAh instead of paying a few tens of cents more for 280mAh? One reason is it has the highest number sold among the sub-USD$3 batteries. Second reason is that you wouldn't believe that these batteries have over 200mAh anyway. And the same manufacturer probably made them and put them in different packagings. And the charge rate is a giveaway (ya the manufacturers are nice enough to print the charge rate on the sticker) - 15 hours at 20mA. Usually the formula for charge rate and time is 1.5 x 10 hours x 0.1C. 10 hours @ 0.1C gives full charge but some extra is needed to make up for losses and give it a bit of overcharge. That 20mA pretty much tells us the actual capacity. Well, there are batteries on eBay stating 300mAh and 30mA charge rate. Maybe I'll try that out when I need another 9V battery. But by then Chinese LSD 9Vs would most likely be out. Is not the graph. But the note that I only charged it at a rate of 14-15mA on average for 700 minutes, and the charge rate slowed down towards the end before I terminated the charging. There are reasons for this but I'm not going to waste bandwidth. That gives us roughly 160-170mAh of charge, after losses I'm inclined to think the former. 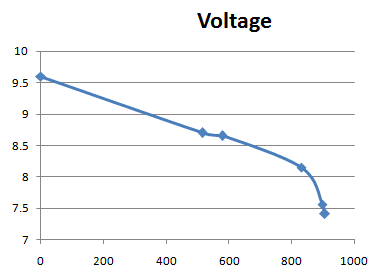 Discharge rate is 10.1mA, which is the current the LM4562 draws. That gives us about 150mAh. Pardon the lack of readings at the start which makes the graph too linear at the start. I didn't have the opportunity to check it. I'm guessing it should be linear up till 8.8-8.9V before it shoots upwards (counting from the back). If you take into consideration that full capacity could be higher, not bad for $3 SGD. At least it is not crap. Now that I know, I can do a 200mAh test, if I decide to do one.